Tilly, three ways: masquerading in the Mirror Universe in Discovery’s first season; cleaning up some mess hall mania in Short Treks; and as a young Starfleet Academy student in Star Trek Online. It’s a great time to be a Star Trek: Discovery fan, but it’s an even better time to be a fan of Sylvia Tilly. Whether it’s in the first episode of Short Treks, Star Trek Online, or even Discovery’s home release, the someday future captain is all over Star Trek. 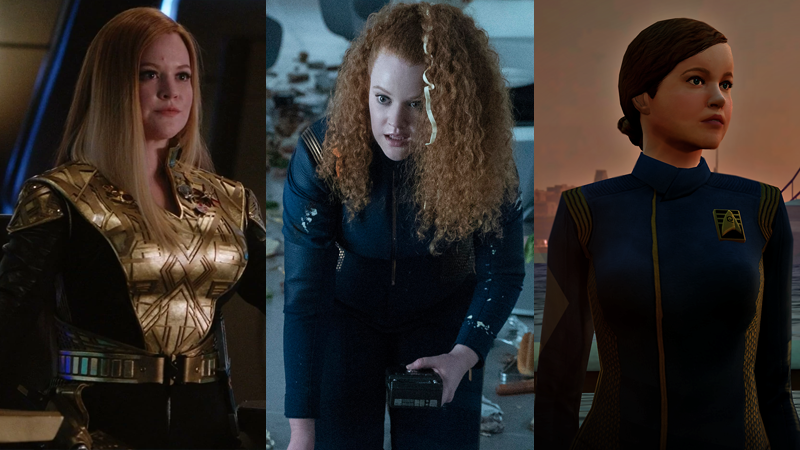 To celebrate, we spoke with Tilly herself, Mary Wiseman, about what to look forward to. Tilly is everywhere right now—Wiseman just headlined the first of the Short Treks minisodes that released last week on CBS All Access, and then this week, she’s lending her voice and likeness to the world of Star Trek Online, for a new ongoing story in the game set in the Discovery timeline. And fans can experience the highs and lows of Michael Burnham’s adventures—with the ever-dutiful Tilly beside her, whether it’s in this universe or the Mirror Universe—all over again when Discovery’s first season hits Blu-ray and DVD in November. Then, the show’s back for season two in January! It really does feel a bit all-Trek, all-the-time right now. io9 spoke to Wiseman over the phone and learned more about how she’s found herself embraced by the boldly goings-on of the Star Trek universe. io9: Tilly goes on such a huge journey throughout this first season of Discovery. Learning how to command, becoming more assured in herself — where do we find her now, going into Short Treks and season two next year? Mary Wiseman: Yeah, so, Tilly is going to continue her journey. She still has a lot of growing up to do. In these Short Treks, she’s going to encounter something completely new, someone who she isn’t sure she has anything in common with and really tries to help them out—and kind of discovers they have more in common than she thought. And that thing that’s differing [from] the first season, is that she’s going to be kind of solo. You know? She’s not going to be able to lean on her friends as much as she did in the first season. She really finds that strength inside and makes some moral decisions based on her own moral compass. io9: Can you tell us a little bit about how Short Treks came about, and what it was like when you were first approached? Wiseman: Alex Kurtzman actually told me about it —I had no idea that this was happening. And then he was like, “I wrote you a script. It’s going to be so cool.” I was thrilled. I was kind of like, flattered, I guess, that they wanted to take some time just to see a day in the life of Tilly. And it ended up being so cool. All the people we worked with, the writing, director, they were so talented. It was just really nice to get a second to focus on a little adventure with Tilly. That was amazing. I felt really lucky. Wiseman: I think getting into the training program is going to be a huge part of Tilly’s future. This is the first step in a ladder she’s been wanting to climb her entire life. So, that’s going to be very important to her— and I think what you see in the short is her feeling like she’s worthy, this is something that’s important that she has support on...it’s also going to be really critical, whether she has the fortitude to struggle through whatever that means. It’s not easy. You get tested in the training program. Cadet Tilly reports to the world of video games for Star Trek Online’s “Age of Discovery”. io9: Another thing you’ve been doing lately is providing voice work for Star Trek Online and its new Discovery content. How did you come aboard on that? Were you aware of the game before? Or is it something you learned about as you were approached with this offer? Wiseman: It was something that I saw on Twitter...I knew it existed. I’m not like a huge gamer myself. I like Mario Kart! [laughs] And yeah, when I was approached about it, it was like...I don’t know, a real out-of-body experience. Being in a video game just feels so cool. I feel like I’ll be able to interact with a whole different part of the Star Trek fan base. I’m really excited. The game looks really cool. So I’m also excited about that. io9: The Tilly we see in Discovery, a lot of her quirkiness and excitability is a very physical performance. What was it like trying to bring that over just through your voice? Wiseman: Well, it’s a transition. I’ve never really done this before. So, I didn’t know how it was going to go. I was nervous about that. Like, everyone wanted it to be real, you know? And I wanted you to feel like it really is Tilly. So I was nervous if I was going to be able to do that. But I loved that the scripts were really good, and it felt very silly in that way that, our Star Trek writers are really tuned into who she is, and her voice. I felt like this really had the core Tilly in it—but, you know, a younger Tilly, because she’s in the academy at this time. So I was very, very happy with the work I was given. io9: Mentioning that, this version of Tilly is just before we meet her in the show. And you having gone through the first season and the second season now, as well, and Short Treks, what was it like going back to “Academy Tilly”? Wiseman: It was actually really wonderful, because it was incredibly informative. As an actor, you want to flesh out your backstory and flesh out where you think your character has been up to this moment. And actually getting to time travel there... actually getting to be Starfleet Academy Tilly. Who, I imagine is even more green than the first time you meet her in Discovery! That was really satisfying for me as an actor. That’s just picking up pieces I hadn’t really got to play with yet. So it was nice, you know? It wasn’t just the Tilly we know and love, it’s the Tilly who has even more growing up to do. Tilly gets into character as her Mirror-self: the Slayer of Sorna Prime, the Witch of Wurna Minor, Sylvia “Killy”! io9: Looking back, your character gets so many of the funny and earnest moments of that first season—like, the party scenes in the time loop episode, or when you get to be Captain Killy. Which of those quintessentially Tilly moments was your favorite to perform as an actor? Wiseman: It’d have to be when I’m on the bridge—I think it was the first time I was on the bridge, as Tilly, first of all, and finding out that Tilly is a captain in the mirror universe. And then having to sort of play that over a the comms. That was my favorite moment—it felt so free, so liberating, it was just really well-written on the page. I got to play with big knives a little bit. That was amazing. And then Jonathan Frakes was directing, so just having his insight, having been on Star Trek, made that kind of special. I think Star Trek has a really beautiful legacy of humor, along with the more philosophical and action parts of Star Trek. And so I felt pretty honored to get to keep that legacy going. io9: At first going into the show, some fans had uncertain feedback about Tilly, because she’s not what some expected of a prim and proper Starfleet cadet. But she’s grown into one of the absolute fan favorite characters of the series. What’s it been like seeing that turnaround, and being embraced by the fan community like that? Wiseman: Nerve-wracking! It’s a bit like real life, you know? You put yourself out there and you are what you are, you’re a person in the universe. People either get that and like you and go along with the journey, or they don’t. And I understand that, you know, why Tilly is a different character—and I’ve heard talk on the internet that maybe she’s annoying, maybe she’s too much, this or that. And that people came to embrace her, and came to love her, because of those things is very similar to her journey on the show. People are more than their first impressions. And even if someone seems like a lot, or seems this way or that way, it doesn’t mean they’re not a three-dimensional person, with a real life. They’re living their own human experience, too. And seeing people embrace that was really heartening for me, just as a person in the world. “Runaway,” the first episode of Star Trek: Short Treks, is available to watch on CBS All Access now. Star Trek Online’s Age of Discovery season of content begins this Tuesday, Oct. 9, and Star Trek: Discovery season one hits Blu-ray Nov. 16, ahead of the show’s return to CBS All Access on Jan. 17.